Sample photos from Hawkeye added to bottom of review. I finished the overblown Kodak Brownie Hawkeye review, with the second page containing tear-down, cleaning, re-assembly, and the entire owner's manual. The first page has been added to, and has quite a few sample photos, including two full sized scans so you can see the real quality, which may be surprising to some folks. I see samples images from this camera on Flickr and other photo sharing sites, and it doesn't appear they are getting the best out of the Hawkeye, meaning shooting with dirty lenses with smudges, plus, most images are in B&W, you know color film works fine in these cameras! 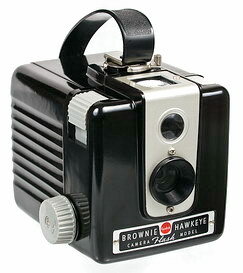 With some care and experimentation, the little Hawkeye is capable of producing some very nice looking photos. I had some scans of the film taken with this camera, and compared the resolution to a fixed lens camera, check out what a fifty-plus year old, five dollar camera can do! I'm now returning to some more lens reviews. Next up; the new Sony 18-55mm kit lens, I'll be comparing it to the old 18-70mm kit lens. Then I'll probably do the Minolta AF 28-135mm F/4-4.5, which is going up in price, now selling for over $400 on eBay, which may be too much, especially if you're using an APS-C camera, we shall see! Also, the Lens price guide has been updated. 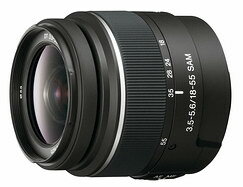 Except for a couple of select full frame lenses, the prices remain stagnant. If you're in the market for a less-expensive Sony lens, now is the time to buy, the prices are dirt cheap. I've added the new Sony lenses to the Sony lens chart. If you want to add a little pizazz to your photography, or are getting bored visiting photo chat rooms and forums for three hours a day instead of going out and taking pictures, try out the 50+ year old, wildly popular Kodak Brownie Hawkeye. These cameras sell on eBay for around $5-$10, and are once again becoming popular for baby boomers, and younger people alike. With this camera you don't have to worry about aperture settings, shutter speeds and focusing. You simply observe, compose, and shoot! As usual, I went overboard with this review, and now have to separate it using at least two pages. This first page is an introduction, with specs and product shots, accessories available, film issues and getting ready to shoot. The next page will cover sample photos, operational tips, a tear-down, cleaning and re-assembly, plus the entire owners manual. I'm not sure if I'll need another page or not. This review is very thorough, and I would guess it to be the most complete to be found anywhere on the web, at least when I'm done! Check out the first page by clicking the image below. Page two is coming up in a few days. The little Minolta AF 100mm F/2 review is complete. This late 1980s lens offers surprising performance in a small package, and would be a very good lens even by today's standards, maybe another reason not to spend more money on new Sony stuff. It doesn't quite match the wide open sharpness of the more expensive Sony 135mm F/1.8 CZ, but it's much smaller, lighter, and did I mention less expensive!